In the previous edition of our newsletter, we announced that Denis Gauvreau had left Genopole at the end of January. 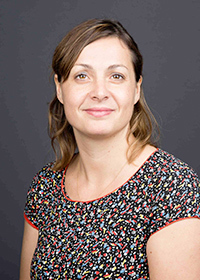 To improve our visibility and activities at the international level, I am very happy to introduce Aurélie Seguin as our new Project Manager for international Affairs (see bio below). She will be the ambassador of Genopole for furthering links and relations with international bioclusters and networks in Europe, North America and Asia and developing strategic partnership agreements. Genopole is also still seeking to increase its European partnerships. With its 20 years of expertise in genomics, biotherapies, biotechnologies, and entrepreneurship, we strongly believe that Genopole can significantly contribute to strengthening the biotech industry and healthcare systems in Europe. To play this major role, Genopole recently joined dynamic networks such as ECCP (European Cluster Collaboration Platform), EBN (European Business Network), EIT Health (Knowledge and Innovation Community established by the European Institute for Innovation &Technology - EIT) and reinforced its contribution to CEBR (Council of European BioRegions). 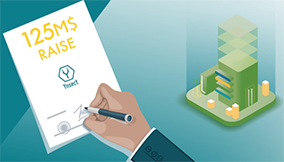 To help SMEs learn about European funding, Genopole is organizing in Paris on May 28, 2019 an info day about European funding programmes for SMEs in the Health industry, in partnership with the Chamber of Commerce and Industry of Paris, the EEN (Enterprise Europe Network), Medicen, and PCN Santé. Entrepreneurs who successfully secured grant funding will also share their experience as laureates of European calls. Genopole is happy to welcome Aurélie Seguin as new Project Manager for International Affairs. Aurélie will be in charge of implementing and following up partnerships already established with Genopole and developing new cluster-to-cluster partnerships. She will also act as Genopole's ambassador abroad by playing an active part in international networks and by representing the biocluster in international conferences. Aurélie is an expert in international affairs, with 15 years of experience in promoting higher education, research institutions and French companies abroad (Austral Africa, South Africa, South East Asia, Indonesia), defining international strategies, and implementing international projects and programs on the ground with public administration. Ÿnsect, a French ag-tech company of Genopole, specializing in breeding insects and transforming them into premium ingredients for fish feed, pet food and organic plant fertilizers, announced that it has recently raised a $125 million (€110m) Series C round to scale up production, by building the world's biggest insect farm in Northern France and to step up its international expansion, by opening a new factory in North America. This investment, the largest-ever ag-tech funding deal outside of the United States, will enable Ÿnsect to accelerate its development and to achieve its main goal, i.e., to become the world leader in the market of alternative protein dedicated to animals and plants, to help create a sustainable food system and to meet the rising demands of global protein consumption. Global Bioenergies has recently announced that test runs using wheat straw hydrolysate provided by its partner Clariant (Germany) were successfully performed in its Leuna demo plant, leading to the production of cellulosic isobutene for the first time at this scale. These runs were part of OPTISOCHEM, a European project that started in June 2017 and was granted €9.8 million by the Bio Based Industry - Joint Undertaking (BBI-JU) as part of the H2020 program. The project focuses on the demonstration of a new value chain, combining Global Bioenergies bio-Isobutene process with technologies developed by Clariant and INEOS, two of Europe's leading chemical companies: currently underutilized residual wheat straw has been converted at demo scale into second generation renewable bio-isobutene, and will eventually be transformed into oligomers and polymers usable in lubricants, rubbers, cosmetics, solvents, plastics, or fuels applications. The intense R&D cooperation will continue until May 2021. Return to France With Genopole’s 2019 Postdoctoral Repatriation Allocation Program ! Genopole's postdoc repatriation allocation program is intended for researchers trained in France who wish to return to France after completing a doctoral thesis or a postdoc abroad, to undertake a research project in a Genopole-based research lab or biotech company. who wish to return to France after completing a doctoral thesis or a postdoc abroad, to undertake a research project in a Genopole-based research lab or biotech company. Research areas: genomics, bioinformatics and systems biology, proteomics, structural biology and biophysics, gene and cell therapy, regenerative medicine, applied life sciences and non-medical biotechnologies, metagenomics, biodiversity and microbial ecology, humanities and social sciences related to the above-mentioned fields. As a grant recipient of Genopole's Postdoctoral Repatriation Allocation Program, Vignesh Janakiraman joined the company Algobiotech In February 2017. In only two years, Vignesh Janakiraman created Algobiotech's research structure and he successfully developed a purification and extraction process for the production of a food colorant, that gives the company a competitive advantage in terms of pigment yield and extract stability over temperature and pH variations. Become A Scientific Leader. 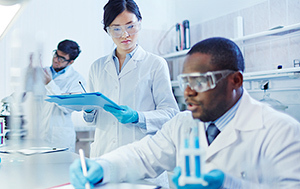 Create Your Own Research Team at Genopole ! Apply to Genopole's ATIGE grant (Genopole Thematic lncentive Actions). 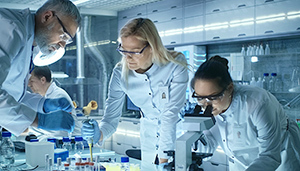 This grant offers tenured researchers the possibility of creating a team within the already-established research units at the biocluster Genopole. The ATIGE grant is open to all research fields of the Genopole biocluster-Evry: genomics, bioinformatics and systems biology, proteomics, structural biology and biophysics, gene and cell therapy and regenerative medicine, applied life sciences and non-medical biotechnologies, metagenomics, biodiversity and microbial ecology. Amount: €250,000 of operating financing for 3 years with priority access to Genopole’s specific calls for equipment investments. Genopole, Telecom SudParis School and the University of Evry are happy to welcome a new scientific team led by Marco Antonio Mendoza. The team will explore the brain complexity. 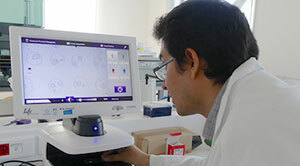 Thanks to Genopole's research grant called "ATIGE program" and cutting-edge equipment and expertise located in the city of Evry, Mendoza's team will be able to work on its BrainFate project. 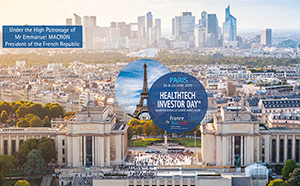 The HealthTech Investor Day® will take place in Paris on June 25, under the High Patronage of the President of the French Republic Emmanuel Macron, with the support of the French and European health innovation ecosystem such as BPI France, Business France, EuropaBio, EIT Health; in partnership with banks, VC and pharmaceuticals companies. For the first time, France Biotech (The French Association of French HealthTech Entrepreneurs) is organizing a one-on-one meetings event to connect leading international investors, big pharma and top management innovative companies in HealthTech. This event is organized for private and listed companies willing to address leading investors and looking to raise funds. Targeted companies: European innovative companies in HealthTech (biotech, medtech, digital-health) with a market-cap starting from €20 million (listed companies) and an on-going Phase 2 minimum for private biotech companies or CE or FDA approved product for medtech companies. 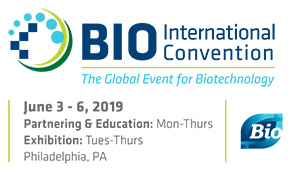 Come and meet Genopole's team at BIO US 2019 in Philadelphia from June 3 to 6 2019 at the French pavilion - booth #2109 - under the Business France banner. Genopole’s 2019 Summer School: Join Us This Summer! Genopole's Summer School on Bioinformatics And Biostatistical Tools In Medical Genomics will take place on June 24-28, 2019. The program is structured around lectures by keynote (or guest) speakers and hands-on practical sessions with experts. It covers statistical methodologies and bioinformatics tools that are used in genomics and metagenomics for a comprehensive approach to understanding pathological mechanisms. The Summer School is intended for English-speaking research scientists, engineers and PhDs already involved in, or planning to start, research projects in the field of genomics for medical research. The Summer School is open to foreign applicants as courses are taught in English. This is a residential summer school with all lectures and sessions taking place on the campus of Châteauform' Les Berges-de-Seine, a beautiful countryside resort located a stone's throw from Paris. Participants will be hosted on campus with accommodation and meals included in the registration fees. The Summer School is limited to 20 participants and applicants must complete a selection form providing a short description of their current (or planned) research projects.